Not suitable for hearing impaired patients. Sound ONLY Alarm. Medication Reminder Pocket Alarm Watch (12 daily auto-repeating alarms) & Electronic Medical Alert hooks on your child's backpack or attaches to your belt loop. 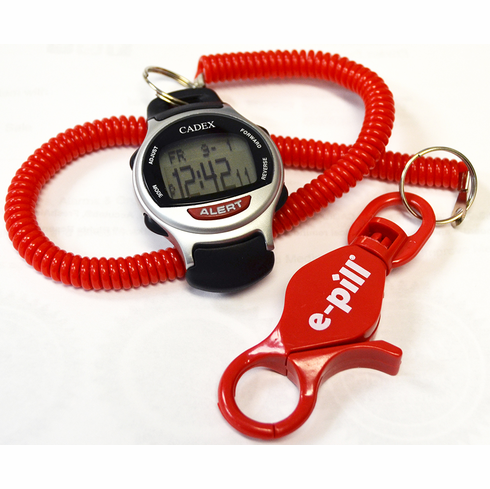 The e-pill CADEX COIL is easy to set and easy to use. Once you have set your e-pill, alarms repeat automatically every day. Easy to read display with large text. Visit CADEX Alarm Wrist Watch Web site. Listen to the Medical Alert CADEX Radio Advertisement | Visit CADEX Alarm Wrist Watch Web site. Over 50,000 CADEX Watches Sold! Watch a Short CADEX Video to see how it works. Hook it to Backpack, Beltloop, Purse, Wheel Chair. Great e-pill Medication Reminder for School, Camp or Travel. 12 Alarm Pocket Watch: Program up to 12 medication reminders (beep alarm + text) including reminder text message (name and strength of medication or other prompts). Message scrolls across the display. Programming is done on the watch (excellent easy to understand manual). Watch VIDEO: CADEX Introduction Video | How the e-pill CADEX 12 Alarm Watch & Medical Alert was invented Video. Manufacturer: e-pill, LLC | One (1) Year Warranty by Manufacturer.